Product prices and availability are accurate as of 2019-04-19 18:44:34 UTC and are subject to change. Any price and availability information displayed on http://www.amazon.com/ at the time of purchase will apply to the purchase of this product. 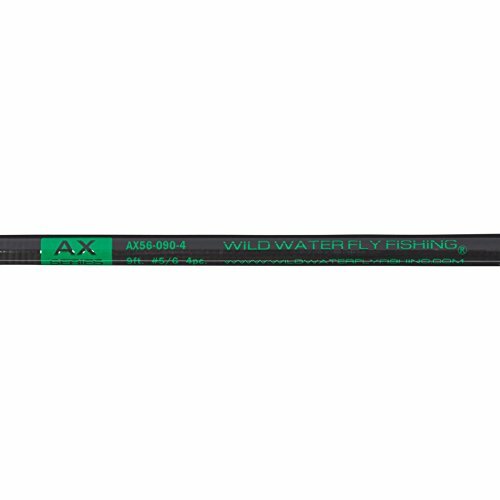 You get our fantastic AX56-090-4 Series 9', 4 piece fly rod with a LIFETIME WARRANTY, a center disc drag die cast aluminum large arbor reel preloaded with backing, a weight forward (5 weight) floating fly line and 5X 9' tapered leader, a rod sock, a rod case, and a fly box with three common fly patterns (Cahill, Foam Beetle and Gold Ribbed Hare's Ear Nymph). You ALSO get an additional spare leader, a spool of tippet material and a total of 18 flies. You will also get an additional spare leader, a spool of tippet material, a pair of nippers with a nail knot tool, a pair of forceps and 2 zingers.This rod is for 5 or 6 weight line and is great for everything from small trout and panfish to small bass. It will fish well at the local pond or on a trophy trout stream. 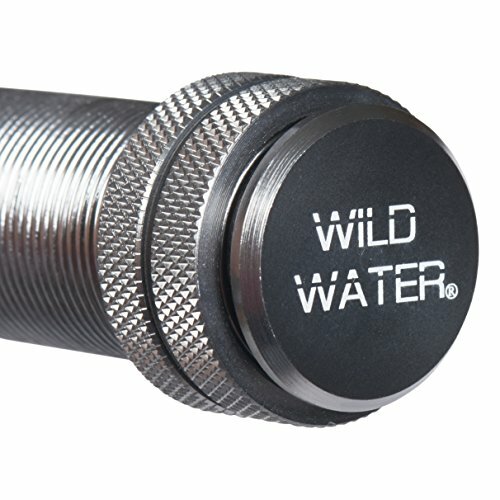 This rod is designed by Wild Water to be very forgiving for the beginning fly caster yet sophisticated enough for an experienced angler to appreciate. When you look at the price you may need to read this a few times to believe it!! Rod Specifications: Line Weight: 5 or 6; Rod Length: 9 Feet; Number of Sections: 4; Rod Case Length: 32 Inches; Flex: Mid; Action: Slow; Material: IM6 Graphite; Rod Weight: 5.7 ounces; Grip: Western; Rod Blank Color: Dark Gray; Winding Color: Black. Suitable fly pattern substations will be make if the flies pictured are unavailable. The reel in this package will arrive set up for LEFT hand retrieve but can easily be changed to right hand retrieve if desired. COMPLETE FLYFISHING COMBO KIT: 5/6 Weight Starter Package includes everything you need to start fly fishing. It comes with a 9-foot, 5/6 weight, 4 piece fly rod, a large arbor reel, preinstalled line, backing and leader, a rod sock, a lightweight rod case with a zippered storage pouch, a fly box, flies, and a detailed instruction book. The starter kit also includes a spare leader, zinger and nipper/knot tying tool. DIECAST ALUMINUM FLY FISHING REEL: The diecast reel has stainless steel internal components, a quick release spool, and a disc drag for fine tension adjustments. 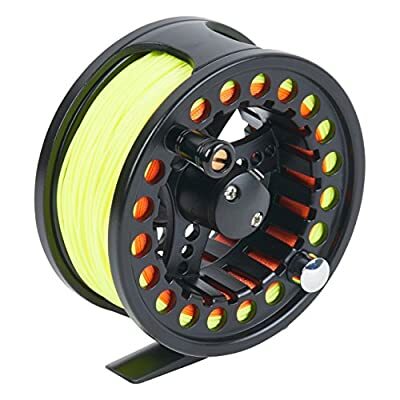 The large arbor designed reel is pre-loaded with a 20-pound blaze orange backing, weight forward 5-weight floating fly line, and 9-foot 5X leader. 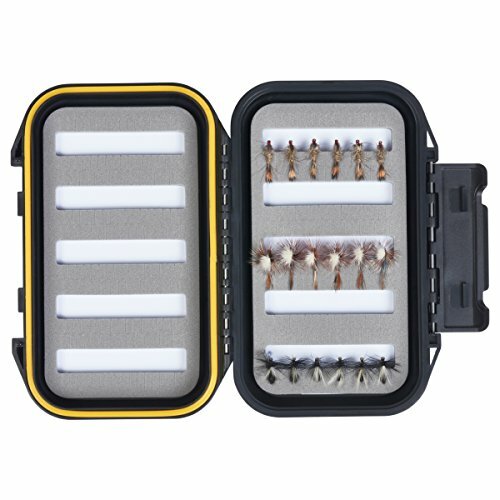 WATERPROOF, FLOATING FLY BOX: The Beginner Fly Fishing Kit comes with a 5.25" x 3.5" x 1.25" Fly Box. Its custom foam design holds up to 372 flies. Includes 3 Black Ant Flies, 3 Parachute Adams Flies, and 3 Gold Ribbed Hare's Ear Nymph flies. All size 14. 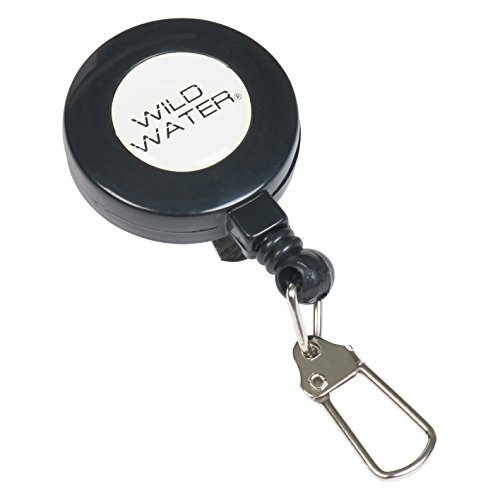 Best suited for trout, panfish, small streams, ponds, and backpacking. 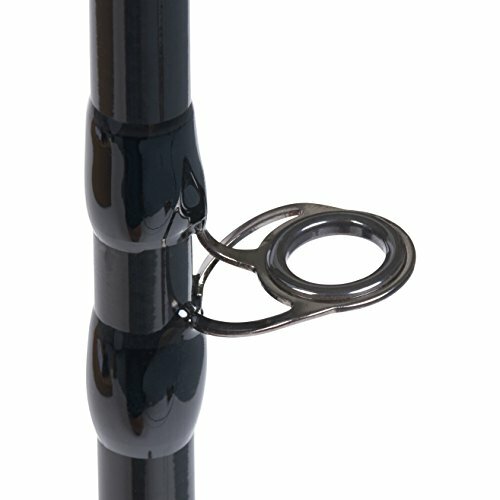 DURABLE & COMFORTABLE: The fly pole with reel is ideal for beginner fly fishers. With a slow action, mid flex IM8 graphite design, the aluminum reel seat and 7 inch western-style cork grip provide long-lasting quality and comfort. The stainless steel stripper guide and single foot snake guide reduce friction and heat. LIFETIME FLY ROD WARRANTY: If any defects arise, contact our customer service to solve the problem.